Let's talk eye cream for a long overdue edition of What's in it Wednesday on The Beauty Blogger. I usually use the eye creams I am sent for editorial purposes, with the exception of the First Aid Eye Roller and 100% Pure Caffeine Eye Cream. I was out of the Beautycounter one I was sent and didn't like it enough to repurchase, so I was at Target and decided to read ingredients labels and purchase one there. After 10 years (almost) of blogging, I can tell you that I have found what I would call my Holy Grail eye cream. Not only are the ingredients fabulous, but the price is super affordable! The product will set you back ten to twelve bucks and it is really pretty priceless: CeraVe Eye Repair Cream. 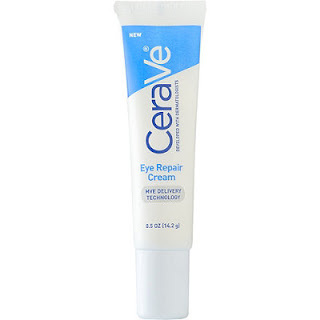 I will continue to repurchase this cream because I have never been happier with an eye product. It works. It is affordable. It has proven ingredients. First, let's look at the packaging. This is the perfect package for a skincare product. It is in a tube that is opaque so the ingredients won't be degraded by light. It is hygienic because it is in a tube -- jars are breeding grounds for bacteria and moisture. Yes, you can use a scoop or mini spoon or Q-tip, but not many people do. They just stick their fingers in the jar to get the product only to leave behind germs. The tube that this is in is really ideal for a skincare product. There are no parabens in this formula. My stance on parabens has shifted over the ten years I have been blogging, more than 7 of which were spent as a pretty strict green blogger. I no longer consider myself a green blogger, nor do I only seek out "clean" "green" or "natural" products. I just want a product that will work and to have proven ingredients. that are backed by science. Niacinamide - Also known as Vitamin B3, nicinamide is anti-inflammatory, which makes it useful at treating acne, plus it is a powerful anti-aging ingredient. It has firming properties, may help to brighten the skin, and penetrates deeply, making it effective at fighting wrinkles. Hyaluronic Acid - One of my most favorite ingredients in skincare, HA can hold 1,000 times its weight in water, Impressive! In other words, it is a fabulous hydrator. It is also a remarkable skin restoring ingredient and antioxidant. Ceramides - A naturally occurring lipid that replenishes and restores the skin. In skin care, the ceramides are plant-derived or lab created. Ceramides help improve skin texture and are tried and true anti-agers. Chrysanthellum Indicum Extract - This one is Golden Chamomile. It is known for its ability to help calm the redness associated with Rosacea. Additionally, it is a lovely skin softener. Tocopherol - Vitamin E is skin protective and one of the best known antioxidants. Equisetum Arvense Extract - Horestail -- don't worry! This isn't from animal, but rather a perennial herb with natural silicon. It is a great skin brightening ingredient, making it ideal for the under eye area. Asparagopsis Armata Extract - This is another ingredient that you don't often see. It is a form of wild seaweed and is emollient and a protective antioxidant. Ascophyllum Nodosum Extract - Another species of seaweed, this is both emollient and antioxidant. The Bottom Line: I give this product an A+. Quite simply, it is the best eye cream I have tried in any price range!